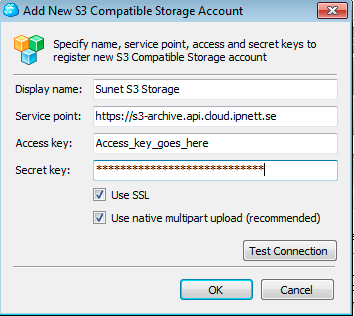 and in the next menu, give it a name, add endpoint URL https://s3-archive.api.cloud.ipnett.se and the access_key and secret_key you got while enrolling for the service. From this point on, you can use it like any graphical FTP or SCP client, you can open local folder or another remote folder on each side and drag-n-drop files and folders between the sites. Apart from manual up- and downloads, you can also Sync Folders from one side to the other. This will compare the two sides and copy missing files to the destination side. You may save the chosen sync settings and run it at a later date again with identical settings. You may also edit the properties of individual objects or folders by selecting them in the list and pressing the Properties button (alternatively right-click on any remote object) to select who may read or write to the files/folders. For folders, you may choose to apply the setting recursively to the whole directory tree. If you upload a file and ask for its Public URL, you will get something along the lines of: http://s3-archive.api.cloud.ipnett.se/bucket-name/Folder/File.txt which is ALMOST usable immediately. Since the S3 software runs behind a SSL accelerator and loadbalancer it thinks it is serving http in clear text but for the outside users, it must always be https:// so adding the S in https allows you to hand out access to a single file / folder just by giving out the URL to the object(s) in one or more of your S3 buckets. 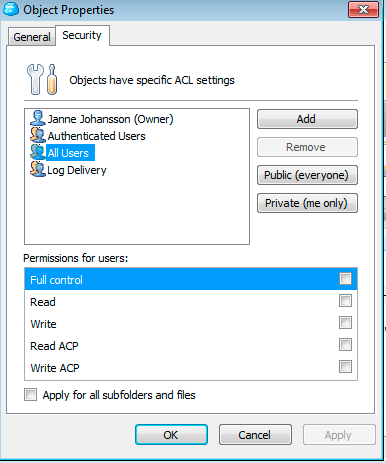 If you register CloudBerry, you will be able to add parallel upload/download capabilities, the ability to compare folders, map a remote path as a windows unit letter (X: for instance) and so on.